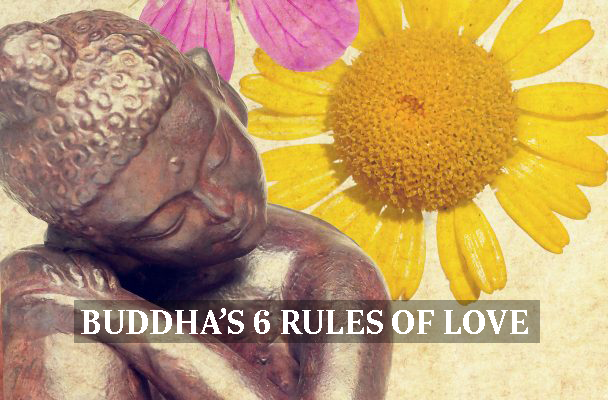 Buddha’s 6 Rules Of Love. The first step in truly finding love is recognizing you need to love yourself. When you do that, you create a strong foundation for a lasting bond with someone, and open yourself to the possibility of being fully present for them. When you truly love yourself, you see the reflection of that love within someone else. This is because we’re all connected; spiritually, we’re all one. The idea that something or someone outside of yourself will give you the peace and love you’ve been seeking is not exactly correct. According to eastern philosophy, when you do that you set yourself up for eventual disappointment. This is because everything is fleeting; emotional happiness comes and goes like the wind. But real happiness comes from a state of being. That is, it flows naturally from within. You don’t need to add anything to it…it’s already there. Noticing that completeness within, you can truly offer something in a relationship. It’s not just one person or a family that deserves our love; the whole world does. Part of the problem we have in the world today is the concept of “Us four and no more.” People think that only their family is worth their time and effort. But imagine what would happen if we viewed the entire world as our family? Suddenly, we start to expand that circle of love, and we feel an obligation to help others. If everyone had that ideal, the world would be a very different place. It’s really easy to get in a mood and project that onto other people…especially those we love. Saying negative or harmful things to others can seriously damage our relationship with them, and hurt our ability to to create a strong bond. If you ever find yourself in a situation where someone is saying something hurtful or damaging, remember that there’s always an option in how we react. Choosing to come from a place of love rather than anger can not only save a relationship, but also help that person understand there is a better way to go about things. Not only that, but reacting with anger only gives more fuel to the fire. One of the most common things I see in relationships is one or both of the partners are looking around to see if the grass is greener on the other side. There’s a constant subconscious desire to see if they can get something better. In short: they’re not committed. Not having gratitude for someone in your life can really set things up to fail. Recognize what you have! Sometimes it’s better than you realize. This article was republished from blog.sivanaspirit.com. You can find the original post here. This Was The Last Message of the Buddha. Destroy Your Moles, Warts, Blackheads, Skin Tags and Age Spots Completely Naturally! CHOOSE A BUDDHA TO KNOW YOUR FUTURE AND RECEIVE A BUDDHA MESSAGE! What Is the Buddha Doing With His Hands? Here Are The Meanings! © Copyright 2015 Peaceful Of Life. Blogger Templates Designed by Bloggertheme9. Powered by Blogger.